Dermarose Review: Is Dermarose a Scam or Legit? Dermarose Swiss Rose Stem Cell Anti-Aging Face Cream is a skin care formula that hydrates the skin thoroughly while at the same time promoting cellular growth. It also helps protect against environmental stress to protect the skin from premature aging. The product is said to smoothen the skin by helping it regenerate which reduces the appearance of fine lines and wrinkles. It uses natural active ingredients like avocado and soybean oil to deeply moisturize the skin and help slow down the skin aging process. A 1 oz. container is being sold online for $143 but there is a free trial offer on the Dermarose website. The manufacturer of Dermarose is unknown. It is also unclear where the product is made. This is not a good sign in terms of product quality, effectiveness and safety. 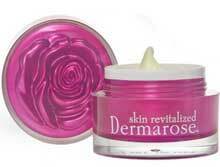 Dermarose primarily works by enhancing the regenerative properties of the skin. This promotes the growth of new, healthy cells which helps reduce the severity of fine lines, wrinkles and other skin aging signs. The formula also contains active ingredients that protect the skin from the main causes of premature aging. It also deeply hydrates the skin which helps slow down the skin aging process and gives it a more youthful appearance. The formula also utilizes the power of antioxidants to slow down the skin aging process. Swiss Rose stem cells – This is the primary active ingredient of the product. It is said to smoothen the complexion by regenerating the skin. It promotes the growth of new, fresh and healthy skin cells. This makes the skin smoother, suppler and overall more youthful in appearance. Avocado and soybean oils – This combination is for thoroughly hydrating the skin to prevent dryness and help slow down the skin aging process. These ingredients also help protect the skin from environmental factors that cause skin aging signs to develop. Hyaluronic acid – This is another powerful ingredient that moisturizes the skin. It is one of the most powerful natural moisturizing ingredients that help in preventing premature skin aging. CoEnzyme Q10 – It is a powerful active ingredient that works to protect the skin from environmental stress. Some studies have shown that it is effective in fighting aging. Vitamin E – It is a powerful antioxidant that helps protect the skin from free radical damage which is among the main causes of the development of skin aging signs. Apply a thin layer on clean, dry skin preferably after cleansing. It can be used up to three times a day for optimum effectiveness. Perform skin testing to check how your skin will react to the formula. Check the ingredients carefully and make sure you’re not allergic to any of them before use. If you have highly sensitive skin, check with your skin care professional prior to use. In case of severe skin irritation, wash with water and discontinue use. Avoid contact with your eyes to prevent irritation. After thoroughly examining Dermarose and checking what users are saying, it is a good anti-aging product. There are many feedbacks saying it works and the formulation includes impressive anti-aging ingredients. The main weakness of the product is its high price but it comes with a 100% satisfaction guarantee. All in all, it is still worth trying although there are better options on the market if you’re looking for a complete anti-aging formulation.